Christine Trombley stands in front of the telescopes at the W. M. Keck Observatory on the summit of Mauna Kea, Hawaii. The RIT astrophysical sciences and technology graduate student will earn her Ph.D. this May. Christine Trombley keeps an ambitious to-do list. This May, she will check off her latest achievement—earning her Ph.D. from RIT’s astrophysical sciences and technology program. Trombley, originally from Warren, Mich., studied the mass distribution of stars in clusters for her dissertation, “Investigation of the Intermediate and High End Initial Mass Function as Probed by near-Infrared Selected Stellar Clusters.” Her research at RIT led to an observing trip to Mauna Kea, Hawaii, and a three-month internship at the Goddard Space Flight Center in Greenbelt, Md., to gather data about groups of extremely large stars. Trombley’s thesis adviser, Don Figer, director of RIT’s Center for Detectors, is an expert on massive stars. The conferral of Trombley’s degree will bring closure to the inaugural class of astrophysical sciences and technology students that started the program in 2008, says Andrew Robinson, director of astrophysical sciences and technology. “Christine was the first AST student to win an external fellowship—a NASA Graduate Student Research Fellowship—and when she graduates in May, she will also become the first woman to earn a Ph.D. in the AST program,” Robinson says. 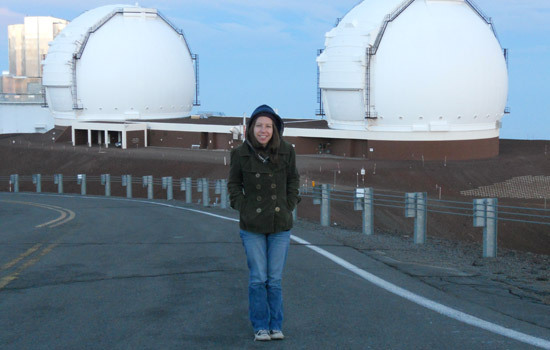 Trombley is currently looking for a postdoctoral fellowship to continue her astrophysical research on massive stars and add to the collective understanding of the world. Some people see massive environmental issues as unsalvageable, but Kristen Denninger Snyder ’10 sees them as motivation to keep working toward environmental conservation. Later this year, she will open the Research and Innovation for the Serengeti Ecosystem (RISE​) in Tanzania and serve as the center’s head scientist. Assistant Professor Ben Zwickl has earned a prestigious National Science Foundation award to explore how lab-based, project-based and work-based learning environments can teach sophisticated problem-solving skills not attainable in lecture courses.